France's cabinet has stepped down in preparation for a planned reshuffle by President Nicolas Sarkozy. In a statement, Mr Sarkozy's office said he had accepted the resignation of Prime Minister Francois Fillon and his other ministers. The move, described by analysts as a formality, allows Mr Sarkozy to appoint new ministers without first having to dismiss those holding posts. Mr Sarkozy's supporters are vying for positions ahead of his expected bid for re-election to the presidency in 2012. Government sources say Mr Fillon is likely to be reappointed prime minister, the AFP news agency reports. 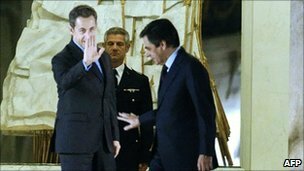 Mr Sarkozy had previously indicated he would reshuffle his cabinet after controversial reforms to the country's pension system were passed by parliament. The reforms were approved last month, but led to widespread protests. Mr Sarkozy's popularity ratings are at a record low and correspondents say he will be hoping his reshuffle can move some of those ministers most closely connected to the controversy and prepare the way for the presidential elections.